Masjid al-Nabawi (Arabic: المسجد النبوي; “The Prophet’s Mosque”) was built by the Prophet ﷺ shortly after his migration from Makkah to Madinah in 1 AH (622 CE). It was originally a small mosque built from mud bricks and palm fronds but has undergone several expansions throughout history making it one of the largest mosques in the world today. The grave of the Prophet ﷺ, as well as the graves of two of his most faithful companions, Abu Bakr al-Siddiq and Umar ibn al-Khattab رضي الله عنهما, are located within the mosque, making Masjid al-Nabawi one of the most visited sites of Ziyarah. From the offset, Masjid Nabawi was a centre for the community rather than merely a place of prayer. The initial construction carried out by the Prophet ﷺ and his companions demonstrated this, as did subsequent renovations by later generations. After many years of persecution at the hands of the Meccans, in the year 1 AH (622 CE), the Muslim community began their migration to Madinah, which was previously known as Yathrib. The two most prominent Medinan tribes, the Banu Aws and Banu Khazraj united in their support of the Prophet ﷺ and welcomed the emigrant Muslims, known as the Muhajirun (Arabic: المهاجرون‎; “The Emigrants”), with open arms. The Muslim inhabitants of Madinah came to be known as the Ansar (Arabic: الأنصار‎; “The Helpers”). They were taught the tenants of Islam by Mus‘ab ibn Umair I, who was sent by the Prophet ﷺ to Madinah as an ambassador. The Prophet ﷺ and his closest companion, Abu Bakr al-Siddiq I were among the last of the community to make the Hijra (Arabic: هِجْرَة‎, Migration) to Madinah and their arrival in the illuminated city marked the beginning of a new era. The Hijrah also marked the start of the Islamic calendar. After avoiding Meccan search parties and taking refuge in the cave of Thawr for several days, the Prophet ﷺ and his beloved companion Abu Bakr al-Siddiq I reached the outskirts of Madinah after eight days of travel, traversing some 200 miles (320 km). He arrived on Monday 12th Rabi al-Awwal which coincided with his 53rd birthday. Before entering Madinah, the Prophet ﷺ alighted at a place called Quba among the tribe of Banu Amr bin Auf, and built the first mosque at that location. After staying at Quba for four days, the Prophet ﷺ and Abu Bakr continued their migration, before stopping in the valley of Ranuna, where the first salat al-Jumu’ah (Arabic: صلاة الجمعة‎; “Friday congregational prayer”) was held. Let her go her way, for she is under the command of Allah. Al-Qaswa continued until she finally came to a halt and knelt down at a large walled courtyard owned by two young orphan brothers, Sahl and Suhail L, who were under the guardianship of As’ad ibn Zurarah I. The two boys were the sons of Nafia ibn Umar ibn Thalabah al-Najar I. Although the area, which belonged to the tribe of Banu Najjar, had been partly cleared for dying palm dates, it contained boxthorn bushes, palm trees and remains of a building. There was also a polytheist burial site at one end. However, the Prophet ﷺ deemed that the location was ideal for his masjid and his home. The boys, despite their hardships, offered to gift the land to the Prophet ﷺ out of their love for him. Nevertheless, they were given 10 dinars by Abu Bakr al-Siddiq I at the request of the Prophet ﷺ after he spoke to their guardian. After purchasing the land, the Prophet ﷺ ordered the graves to be exhumed, the shrubbery to be cleared and a mosque to be built. This was carried out and the land was levelled until it was made suitable for construction. The mosque was to become the central hub of the Medinan community where religious and social gatherings would take place. 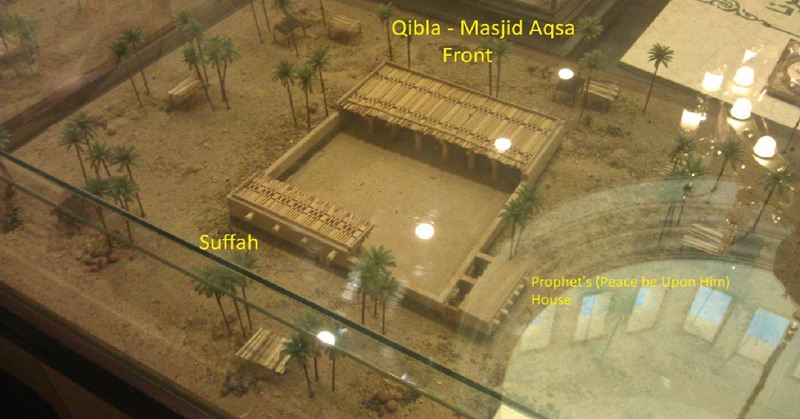 The location where the Prophet’s Mosque ﷺ was built belonged to Banu Najjar. In it there were date-palm trees and graves of the idolaters. The Prophet ﷺ said to them: ‘Name its price.’ They said: ‘We will never take any money for it.’ The Prophet built it and they were assisting him, and the Prophet ﷺ was saying: ‘The real life is the life of the Hereafter so forgive the Ansar and the Muhajirah.’ Before the mosque was built, the Prophet ﷺ would perform prayer wherever he was when the time for prayer came. After alighting, the Prophet ﷺ stayed in the house of the great companion, Abu Ayyub al-Ansari I. He lived on the ground floor until his own house, adjacent to Masjid Nabawi, had been built. The initial construction of Masjid Nabawi started in Rabi al-Awwal of the year 1 AH (622 CE), with the Prophet ﷺ himself taking part in laying its foundations and its development. He marked out the boundary of the site using the tip of a spear he inherited from his father, Abdullah I. It took approximately seven to eight months to build and was completed in the month of Safar the following year. The masjid was originally a rectangular building, measuring about 30 metres from east to west and 35 metres from north to south. The total area was 1,050 square metres. Unbaked bricks were used as building material on top of a masonry foundation which was about 1.5 metres high. Mud was used for the walls and date palm trunks were used as columns. There was a roofed area towards the front of the masjid, which was made from palm tree branches cemented together by beaten clay. It was slightly sloped to facilitate drainage during the rainy season. The roof was attached to the northern wall and stood about 3.6 metres high. The majority of the courtyard was left open. The Qibla (prayer direction) at time was north towards Jerusalem and it remained in this direction for 18 months. The prayer direction was then changed from north to south, towards the direction of the Kaaba, and the original mihrab (prayer niche) was converted to a door. The change of Qibla took place where the clan of Banu Salama once resided and the location is today marked by Masjid Qiblatain. The living quarters of the Prophet ﷺ was adjacent to Masjid Nabawi and there was an area for Ahl al-Suffah, a group of poor Muslims, to reside in. This was originally in the southern side of the mosque, but was transferred to the northern end after the change of the Qibla. Eastern Door – It was given various names including the Door of the Prophet ﷺ because he used to enter through it, and the door of Uthman I because it was located at the house of the family of Uthman. It is now known as Bab al-Jibril (Door of Jibril S) because it was through this door that the archangel would enter. Western Door – It was originally known as the door of Atika J because it was faced the house of a companion called Atika who later become the wife of Umar ibn al Khattab. It is today known as Bab al-Rahmah (Door of Mercy). Southern Door – It is now known as the Door of Umar. This door was closed and a new door, the Northern Door, was opened after the qibla direction changed from Jerusalem to Makkah. The Prophet ﷺ also built private living quarters (hujarat) for his wives Aisha and Sawda K to the east end of the masjid, which were later extended as his household expanded. 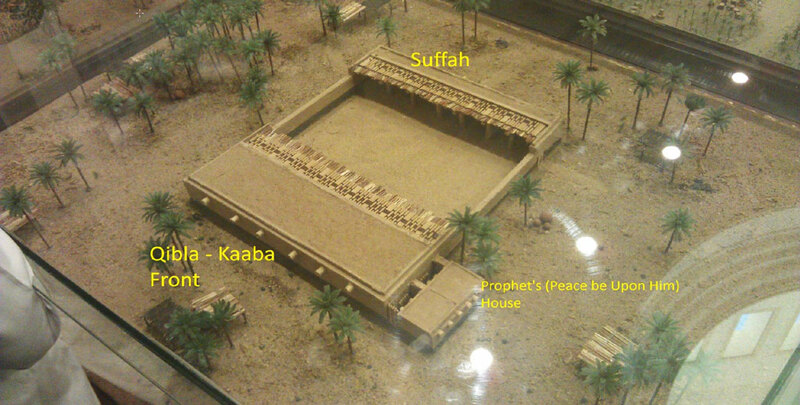 Following the Battle of Khaybar, the Prophet ﷺ received funding which allowed him to enlarge the mosque. The ever increasing number of Muslims necessitated an increase in the area of the mosque to accommodate for more worshippers. By that point the mosque wasn’t just a place where the obligatory prayers were performed. It was also a place where teaching was carried out, politics were discussed, delegations were received and the needy were catered for. Uthman ibn Affan I, the Prophet’s ﷺ son-in-law and the third Caliph, who was known for being wealthy and spending generously in the way of Islam, purchased some land next to the Masjid Nabawi from a member of the Ansar, with the permission of the Prophet ﷺ. This land was then used to significantly extend the area of the mosque. The total area of the mosque was increased to about 2200 square metres and the height of its walls was increased to about 3.6 metres. The masjid was extended to the north, east and west and each side now measured about 47 metres, making the masjid almost square. Three rows of columns, about 15 metres deep were added to the west wall. This area became the main space for prayer. A minbar (pulpit), which was constructed from Tamarisk wood by the companion Tamim al-Dari I, was also provided at the request of the Prophet ﷺ. The minbar had two steps and provided seating from which the Prophet ﷺ could address his companions. Prior to this, the Prophet leant against a tree trunk when speaking with the Sahaba. By this point, the prayer direction had changed and the living area for the Ahl al-Suffah was moved to the back of the masjid (north side). There were no major alterations to the masjid during the caliphate of Abu Bakr al-Siddiq I, who ruled from 11-13 AH (632-634 CE), following the demise of the Prophet ﷺ. He is said to have repaired the worn out palm pillars during his two year reign as caliph. The mosque remained like this for a period of 11 years until the caliphate of Umar ibn al-Khattab I. As the size of the Muslim community further expanded as a result of the increasing number of Islamic conquests, Umar ibn al-Khattab I, who ruled from 13-24 AH (634-644 CE), decided to further extend the mosque during his caliphate. In 17 AH (639 CE), he bought some houses surrounding the mosque to achieve his goal, although the houses owned by the wives of the Prophet ﷺ remained untouched. The masjid was now rectangular in shape again, measuring about 58 metres from east to west and 66 metres from north to south. The wall was constructed from sun-dried mud bricks and was built on a foundation made of stone, which was about 1.8 metres deep. The roof was increased to a height of 5.6 metres. Small stones were also scattered across the floor and woven palm fronds provided carpeting. Umar I also introduced incense, which was used every Friday and during Ramadan. In addition, he introduced an area on the east side of the courtyard known as al-Butayha, which allowed people to discuss their worldly affairs and to recite poetry, away from the ritual prayer. The columns, minbar (pulpit) and mihrab (prayer niche) from the previous construction remained intact despite the extensive renovation of Umar I. By this point, the population of Madinah and the Muslim community was growing rapidly. The city itself was expanding at a fast rate and a number of new buildings were being constructed. Uthman ibn al-Affan I, who was caliph from 23-36 AH (644-656 CE), made the decision to expand the mosque further to accommodate the expanding community, after consulting with various dignitaries. In the month of Rabi al-Awwal 29 AH (649 CE), 12 years after the previous extension was carried out by Umar ibn al-Khattab I, a new development program of Masjid Nabawi began. The mosque was demolished and a brand new structure was built, taking 10 months to complete. Work finished in Muharram 30 AH (650 CE). 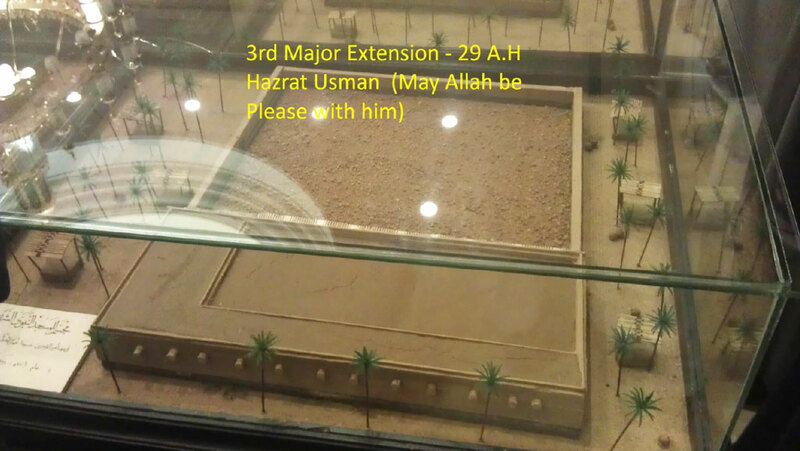 Uthman I personally took part in the construction activities of the masjid. The roof was made from teak wood sticks, which were likely to have been imported from India via the port of the Ubullah, located near Basra in Iraq. The number of doors remained the same, as did their respective names, although their positions would have been affected, specifically Bab al-Salam and Bab ar-Rahman on the west wall. Despite the large renovation, the original layout of the mosque was preserved. The mimbar (pulpit) remained in the same position, as did the Prophet’s ﷺ mihrab (prayer niche). However, a new mihrab was erected at the north wall where the imam led prayers from, allowing for more prayer space. The Prophet’s ﷺ mihrab was no longer in use and now stood in the prayer area. The total area of the mosque was now over 5094 square metres. The extension to the front of the mosque (the south side) was the final extension to have been made to this particular side. There have been no further extensions beyond this to this day. At the end of the first Islamic century, the caliph of the Ummayad dynasty, Al-Walid ibn Abd al-Malik I, who ruled from 86-96 AH (705-715 CE), enlarged and renovated Masjid Nabawi extensively. From a relatively simple building, it was converted into a strikingly designed monument. Interestingly, al-Walid I is said to have been assisted by the Byzantine (Roman) emperor who, according to Shaykh al-Islam Ibn Qudamah al-Maqdisi V, sent 40 Roman labourers and 40 Coptic labourers as well as gold and mosaic tiles for the renovation. Other significant mosques in the Islamic world were also being built during this period; namely the Dome of the Rock and Al-Aqsa mosque in Jerusalem, as well as the Great Mosque of Damascus (also known as the Ummayad Mosque). The renovation of Masjid Nabawi began in 88 AH (708 CE), 59 years after the previous renovation by Uthman ibn al-Affan I. It was overseen by the governor of Madinah at the time, Umar ibn Abd al-Aziz I, who was the great-grandson of Umar ibn al-Khattab I. It was completed in 91 AH (711 CE), taking three years. Some historians believe the renovation was completed in 93 AH (713 CE). 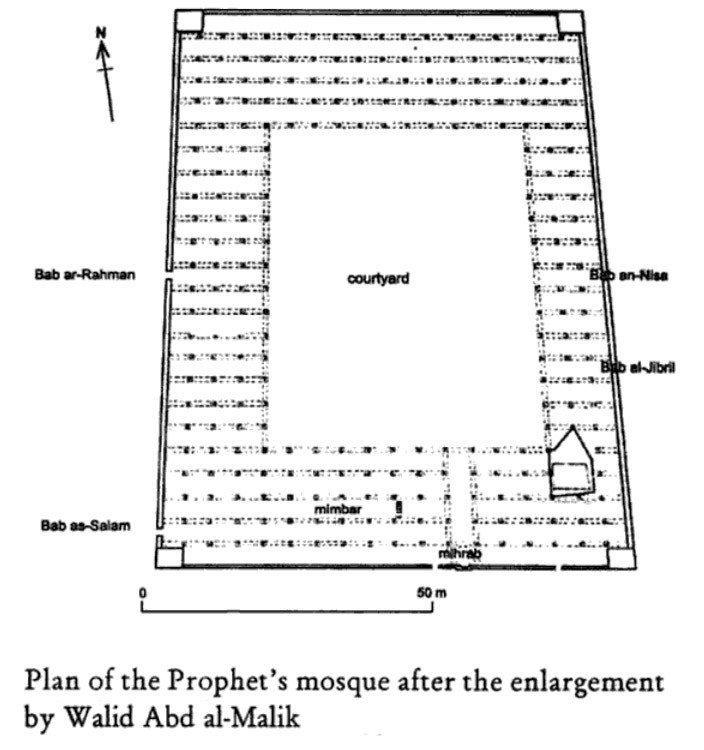 The masjid was now trapezoid in shape, measuring just over 100 metres long. All the sides of the mosque were significantly extended. The north and south walls measured just over 68 metres and 59 metres respectively. The total area of the mosque now covered almost 6,440 square metres. 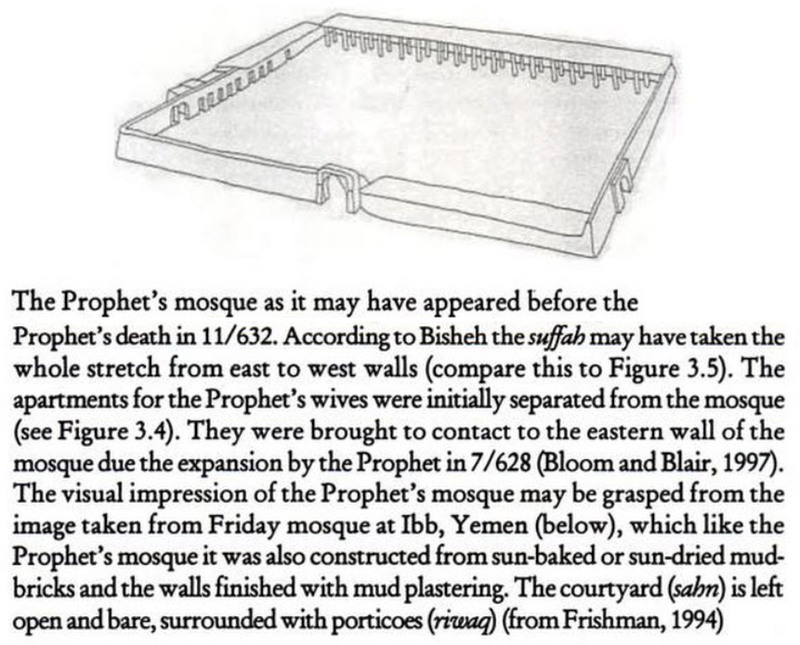 The Prophet’s ﷺ burial place was now located inside the mosque after the east wall was repositioned. 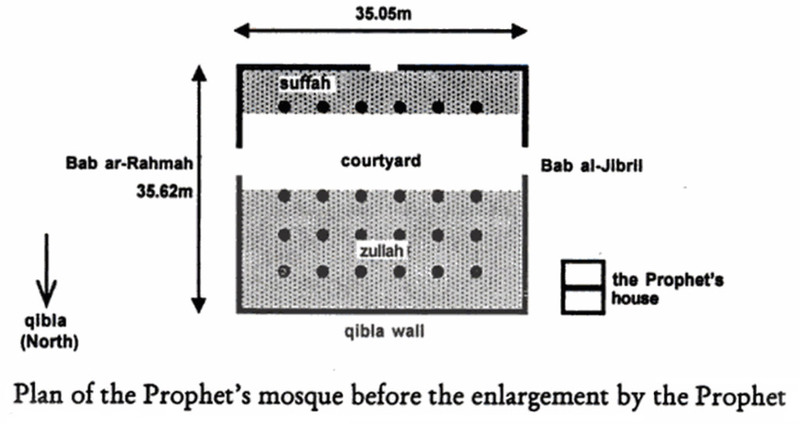 A pentagon-shaped wall was also built around the four walls of the Prophet’s ﷺ sacred chamber. The hujarat (living chambers) belonging to the wives of the Prophet ﷺ, which had earlier been demolished, were now also incorporated within the mosque. The demolition of the hujarat was opposed by those living in Madinah and a great sadness befell the citizens when the blessed homes were razed. For the first time in the history of Madinah, minarets were added to a mosque. Four minarets, each measuring 27.5 metres in height, were erected at the four corners of the building. The call to prayer was made from these minarets. New walls were constructed on a solid stone foundation. A double ceiling was built. The lower ceiling was made from teak wood and decorated with gold. The number of doors increased to 20. The inside of the walls were decorated by gold, marble and mosaic tiles. Porticoes were added, adjoining the northern section of the mosque and main prayer area. There was an open-air courtyard in the middle of the mosque. The third caliph of the Abbasid dynasty, Abu Abdullah Muhammad al-Mahdi V, who ruled from 159-169 AH (775-785 CE), extended the northern side of the mosque (the back) by about 27 metres. This was carried out between the years of 161 AH-165 AH (779 CE–783 CE), 70 years after the previous renovation. 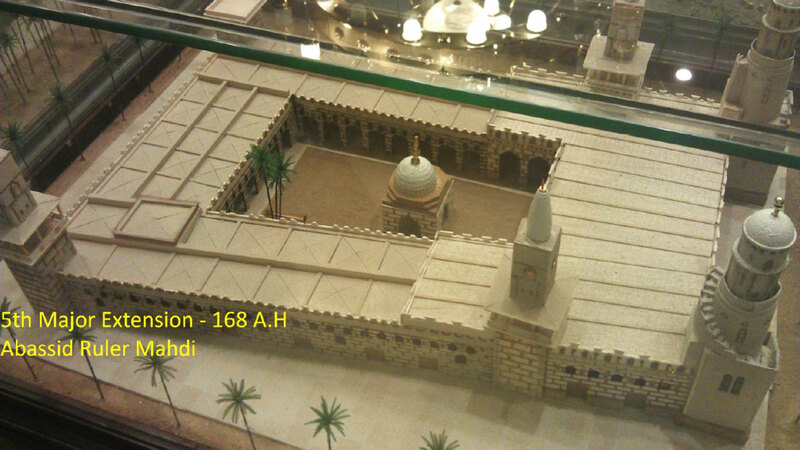 The caliph decided on the extension of the mosque after performing Hajj and visiting Masjid Nabawi in 160 AH (777 CE). He appointed Ja’far ibn Sulayman V to oversee the extension. The total area of the mosque now covered about 8,890 square metres. The expansion was approximately 2500 metres in area. Masjid Nabawi was twice substantially destroyed by fires, the first of which started on 1 Ramadan 654 AH (1256 CE). On this occasion, the fire was caused by a candle or an oil lamp. The fire spread to curtains, carpets, prayer mats and eventually engulfed the whole masjid. The original mushaf of Uthman I was destroyed during this fire. After this incident, a number of Muslim leaders participated in the reconstruction of the masjid. The first among those was the Abbasid caliph, Al-Musta’sim Billah V, who sent supplies and masons from Baghdad. The repair work began in 655 AH (1257 CE), although this was interrupted when the Mongols invaded and occupied Baghdad, the capital of the Abbasid Caliphate, in the same year. Although some areas of the mosque had been cleared, the debris that had fallen onto the tomb of the Prophet ﷺ as a result of the fire remained. Temporary roofing made from wood was erected and several layers of cloth were hoisted around the tomb of the Prophet ﷺ. A number of Mamluk Sultans worked on the mosque including al-Mansur Nur al-Din Ali V and Saif al-Din Qutuz V but it wasn’t until the rule of Sultan Al-Zahir Baybars V in 668 AH (1279 CE) that the mosque was given its due attention and comprehensive restoration work was carried out. 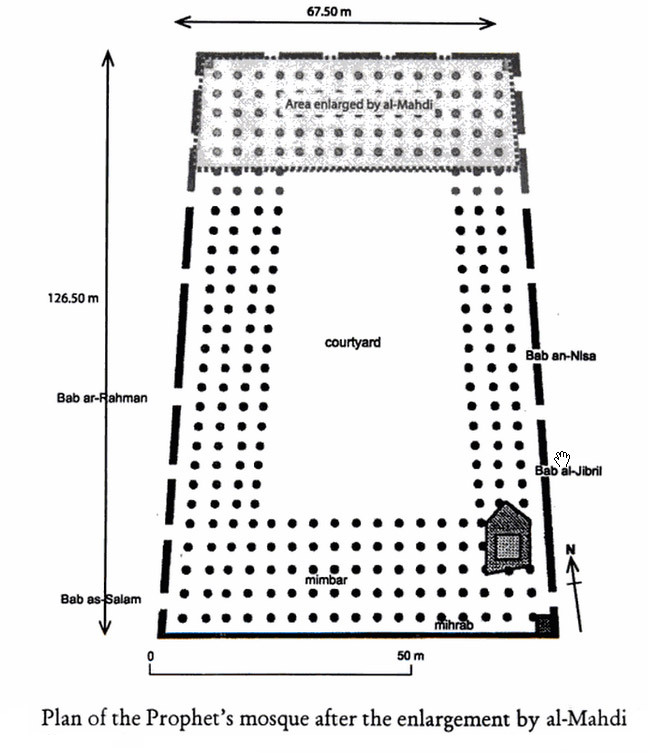 Sultan Baybars V built a high wooden enclosure around the tomb of the Prophet ﷺ and the chamber which contained the house of Fatima J, the measurements of which he is said to have taken personally during a visit to Madinah. This enclosure, which includes part of the Rawdah, still exists in Masjid Nabawi today, although it was replaced with metal at a later stage. The Sultan also provided the mosque with a new minbar (pulpit). In the year 678 AH (1279 CE), at the start of the reign of Mamluk Sultan al-Mansur Qalawun V, a dome was built over the tomb of the Prophet ﷺ for the first time in its history. This dome was originally made of wood and was unpainted. He also carried out repair work to ceiling of the masjid at a later stage. The second major fire took place in 886 AH (1481 CE) after a lightning strike, which destroyed the vast majority of Masjid Nabawi. During one dark and stormy night, the Mu’addhin went to give Adhan for Isha prayer when a bolt of lightning struck the minaret causing it to come crashing down. The Mu’addhin was killed and a fire began on the roof of the mosque. The entire masjid soon became engulfed in flames, which also spread to nearby houses. The inhabitants of Madinah rushed to the mosque to help extinguish the fire and to preserve whatever they were able to preserve. Several people died in this fire. Sultan Al-Ashraf Qaitbay V, the 18th Mamluk Sultan of Egypt, who reigned from 873 – 904 AH (1468 – 1498 CE), undertook the task of restoring the masjid. Like his predecessors, the responsibility of the mosque’s maintenance was of great important to him. He had in fact started reconstruction work of the mosque five years earlier in 881 AH (1476 CE) when he rebuilt entire sections of the mosque, renovating the Rawdah, replaced the ceilings and attended to the tomb of the Prophet ﷺ, the walls of which had developed cracks after the previous fire. However, all of this hard work was undone following the second fire. The tomb of the Prophet ﷺ was renovated extensively. The wooden base at the foot of the dome was replaced with a stone structure to stop it from collapsing in the future. Lead plates were used to further strengthen the wooden part of the dome. The walls of the tomb were also covered in marble. The wooden enclosure around the Prophet’s ﷺ tomb was replaced with brass railings. The South-Eastern minaret was knocked down and rebuilt. Sections of walls were knocked down and rebuilt thicker. Windows were added to allow more light to enter the masjid. Beautifully designed prayer niches were installed. One such mihrab has been transferred to Masjid Quba in recent times. Public drinking foundations were added. The work was completed in Ramadan 888 AH (1483 CE), although further work to the main minaret and the dome carried on until 891 AH (1486 CE). Being a dutiful ruler, the sultan also built lodging for pilgrims and a school for students. Scholarships were granted to students and a trust was established for the maintenance of the masjid complex. These were located near the western wall of Masjid Nabawi, between Bab al-Salam and Bab al-Rahmah. He also built a public bath-house, a flour mill and a kitchen which regularly provided food to the poor in Madinah. The Sultan also sponsored renovation programs of Masjid al-Haram in Makkah and Masjid al-Aqsa in Jerusalem as well as supporting renovation projects of other significant mosques within the Muslim world. The cost of the reconstruction of the mosque as well as the various initiatives the Sultan introduced cost over 120,000 gold dinars. The annual expenditure of the institutions was also covered by the Sultan who sent money from Egypt every year. The mosque, by and large, remained the same size as it previously was. It remained in this form for 387 years, although minor renovations and repairs were carried out by the various Muslim rulers during this period. By this point, the responsibility of the maintenance of the mosque shifted to the caliphs of the Ottoman Empire, after the rule of the Mamluk dynasty of Egypt came to an end in 923 AH (1517 CE). The Ottomans took great care of the masjid. Two doors were installed – Bab al-Rahmah and Bab al-Nisa. The minaret rebuilt during Sultan Qaitbay’s restoration was replaced by a minaret in Ottoman style. This minaret came to be known as “al-sulaymaniyah”. The Rawdah was laid with marble. Marble was added to the Sacred Chamber. A gold crescent was added to the dome above the tomb of the Prophet ﷺ. A prayer niche for Hanafis was added. A section of the western wall was demolished and rebuilt. In the year 1228 AH (1813 CE), the 30th Sultan of the Ottoman Empire, Sultan Mahmud II V oversaw the construction of a new dome. The previous dome built by Sultan Qaitbay centuries earlier was demolished and a new one made from bricks covered with led was made. This is the dome as we see it today, although the green colour wasn’t applied until the reign of his successor, Sultan AbdulMejid I.
Sultan AbdulMejid I V, the 31st Sultan of the Ottoman Empire made the most extensive restoration to Masjid Nabawi after the mosque began to show signs of its old age. Shaykh Dawud Pasha V, the governor of Madinah, informed the Sultan about the deteriorating condition of the mosque by letter. In response, the Sultan sent engineers from Istanbul to assess its state. After returning to Istanbul, the engineers informed the Sultan that the mosque was in need of a renovation. The Sultan initiated the reconstruction program in 1265 AH (1848 CE). Hundreds of skilled architects, engineers, carpenters and masons were sent from Istanbul to Madinah to carry out the work, which lasted until 1278 AH (1861 CE) – a period of 13 years. After arriving in Madinah, engineers set about looking for suitable building materials. The primary building material was hard black stones found in Wadi al-Harrah, which was to be used for the walls, and softer red stones, which resembled carnelian, obtained from the hills near Wadi al-Aqeeq, west of the city. Bricks were quarried, cut and polished at this location and carried to the mosque on animals. During the process, the Sultan kept an eye on proceedings and had emissaries report back to him on the progress. Work began on the northern side of the mosque and the old structure was slowly demolished to make way for the new building. This was done in phases so as to cause minimal inconvenience to the public. The ground level in the western part of the mosque stood higher than other parts of the masjid and was subsequently levelled. The redevelopment program affected the vast majority of the masjid with the exception of the Prophet’s ﷺ tomb, his minbar (pulpit) and mihrab (prayer niche), the Uthmani mihrab, Sultan Sulayman’s mihrab and the minaret at the south-eastern corner of the mosque. The lower parts of the wall were built from stone, whereas the arches and domes were constructed from bricks made from clay and quick-lime. Four original doors were retained and a fifth door, known as Bab al-Majidi, named after the Sultan was added to the northern side of the mosque. This door was also known as Bab al-Tawassul (the Door of Intercession). A new minaret was erected on the northern side of the mosque which replaced the wooden minaret which had been damaged in the fire. There were now a total of five minarets. A well was added to the courtyard, which provided water for a small garden nearby which was named after Fatima J, the daughter of the Prophet ﷺ. Black stone was used in the courtyard. A madrasa and several utility spaces were also introduced in the northern section of the mosque. The prayer area at the south of the mosque was doubled in width. An ablution area was installed outside the masjid between Bab Jibril and Bab al-Nisa. Several small domes, each of equal size, were added. The exterior of the domes were covered in lead. The beauty and elegance of the new structure was unparalleled. 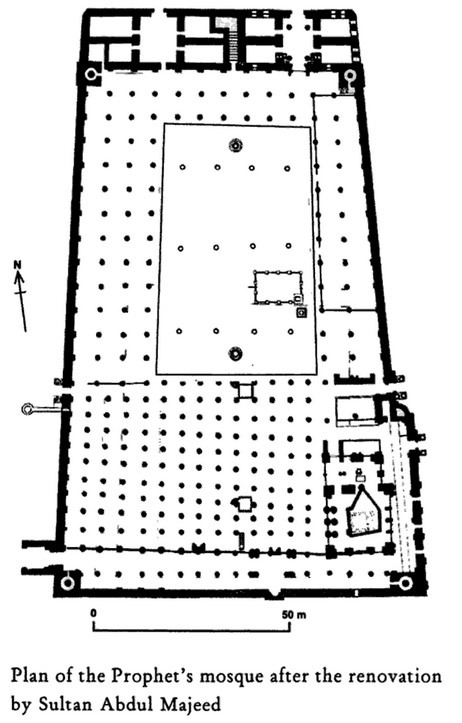 The vast majority of the floor as well as the lower half of the southern wall was covered with marble. The stone pillars and arches were painted in a shade of red, resembling the soft red stone that was quarried from Wadi al-Aqiq and used in the construction of the mosque. The pillars in the Rawdah area were adorned with red and white marble. Liquid gold was used to decorate the top of each column. 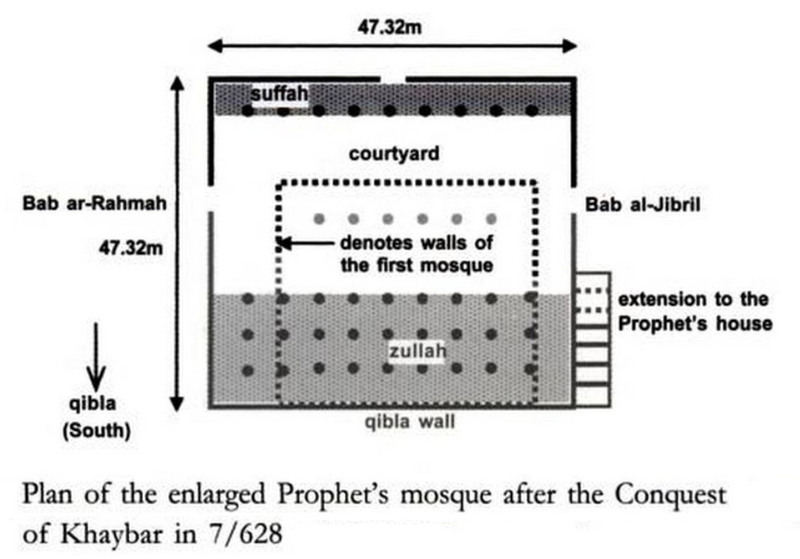 The boundary of the mosque that the Prophet ﷺ built during his lifetime were highlighted on the wall above the columns, the bases of which were covered in brass. Walls around the mosque and interior of the domes was elegantly decorated with unique patterns alongside verses from the Quran, poetry in praise of the Prophet ﷺ as well as the names and attributes of the Prophet ﷺ. These were written in beautiful Arabic calligraphy by the master Ottoman calligrapher, Abdullah Zuhdi Effendi V, who had been specifically sent from Istanbul to carry out the work. It took him three years to complete the assignment. The vast majority of the calligraphy was done on the southern (Qibla) wall of the mosque as well as around the Sacred Chamber and inside the domes. The calligraphy covering the entire southern wall is most likely to be largest of its kind in the world, especially by a sole calligrapher. The last (fourth) row of calligraphy on this wall consists of the 201 names and attributes of the Prophet ﷺ whilst the other rows contain various verses from the Quran. On completion in Dhul Hijjah of 1277 AH (June 1861), the size of the mosque was increased by an additional 1293 square metres to the floor area of what was built by Sultan Al-Ashraf Qaitbay, bringing the total area to 4056 square metres. The south side measured 86.25 metres while the width of the north side measured 66 metres. The length of the mosque from north to south now measured 116.25 (or 126.25) metres. Sultan AbdulMejid was very scrupulous when renovating the mosque, such was his respect for its sanctity. Those that were chosen to work in the masjid had to be Huffaz (memorisers of the Quran), and were trained by the best craftsmen the Ottoman Empire had to offer from a very young age. When working in the masjid, these craftsmen were ordered to be in the state of wudhu at all times and to recite the Quran constantly. More than 350 builders and craftsmen participated in the construction of the mosque as well as a number of engineers, architects and clerical staff. It cost a total of 700,000 Majidi Liras (gold – the Ottoman currency of the time), although this figure does not include the cost of building materials, transport and administration. Sadly, the Sultan passed away just as the finishing touches were being applied to the mosque, although his legacy remains to this day. After the completion of the construction, and in fact throughout the Ottoman era, gifts such as diamonds, pearls, rubies and other precious stones were endowed to the masjid by Ottoman rulers and monarchs from around the world. The Sultan’s successors continued the upkeep of the mosque for the next few decades. The last significant piece of work undertaken by an Ottoman ruler was by the governor of Madinah and true lover of the Prophet ﷺ, Fakhri Pasha V, who had the Prophet’s mihrab and the mihrab of Sulayman repaired in 1336 AH (1917). General repair work was carried out for the next few years until the dissolution of the Ottoman Empire. Sultan AbdulMejid’s renovation lasted for 89 years until the Saudi regime, under the rulership of King Abdul Aziz, embarked on an ambitious expansion program. After the establishment of the Kingdom of Saudi Arabia in 1932 CE, the first major Saudi expansion of Masjid Nabawi was ordered by the first King of Saudi Arabia, King Abdul Aziz. This expansion was in response to the growing number of worshippers visiting the mosque, especially during Hajj season. Furthermore, cracks were also noticed in the structure of the mosque, particularly in the northern section. After announcing his intention to expand the mosque in 1949 CE (1368 AH), construction began two years later, on 5th October 1951 CE (1370 AH). A mosaic factory was established outside of Madinah, in Abyar Ali, where a group of Italian engineers headed the reconstruction work. As non-Muslims, they were unable to enter the city and so were based beyond its boundary. 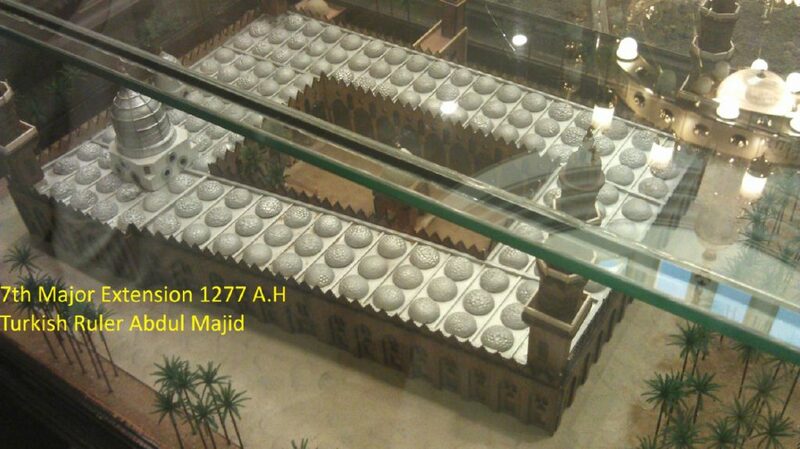 Marble and other building materials were sent from the factory to Masjid Nabawi. More than 30,000 tonnes of construction materials was also transported to the city in vehicles from the port of Yanbu. 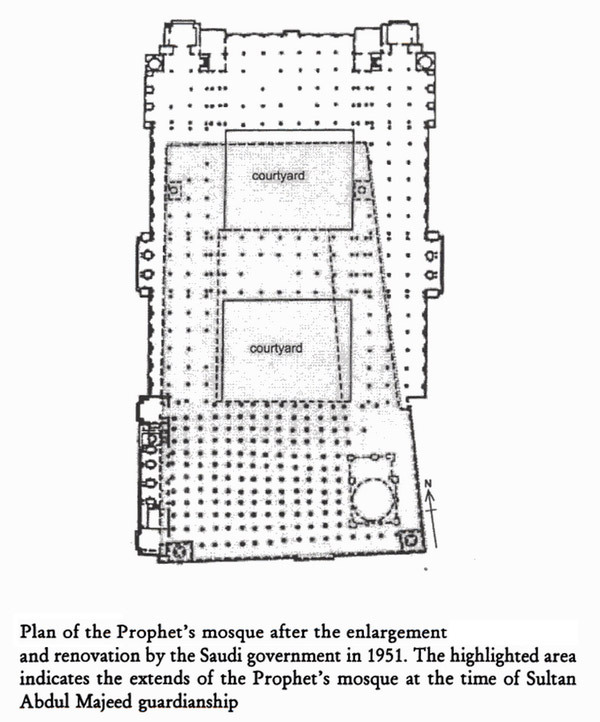 The enlargement was primarily made to the northern section of the mosque, with the east and west wings also being slightly expanded. Land adjacent to the mosque was purchased and its buildings were demolished to make way for the expansion. Masjid Nabawi returned to a rectangular shape after the enlargement, ending the mosque’s 640 year old trapezoid design with a single courtyard. Two minarets were replaced by minarets in Mamluk style and another two minarets were erected. Each minaret was 72 metres in height. A second courtyard, clad with marble, was added to the north of the mosque. Pavilions were added to the east and west wings, either side of the courtyard. Five additional doors were added to the previous construction – the Umar ibn al-Khattab door, the Uthman ibn Affan door, al-Majeedi door, King Abdul Aziz door and King Saud door. A library containing historical copies of the Quran and other religious texts was established on the western wing of the mosque. The southern section of the mosque containing those significant historical elements associated with the Prophet ﷺ remained preserved from the previous construction by Sultan AbdulMejid. This included the Prophet’s ﷺ sacred chamber, the Prophet’s ﷺ mihrab, the minbar, the Rawdah and historical pillars. The green dome and the main minaret also remained untouched. The construction of the mosque took a total of five years, at a cost of 70 million Saudi Riyals. 30 million Riyals was spent on the construction itself, with another 40 million spent on the acquisition of land, bringing the total to 70 million Riyals (equivalent to $18.5 million dollars). 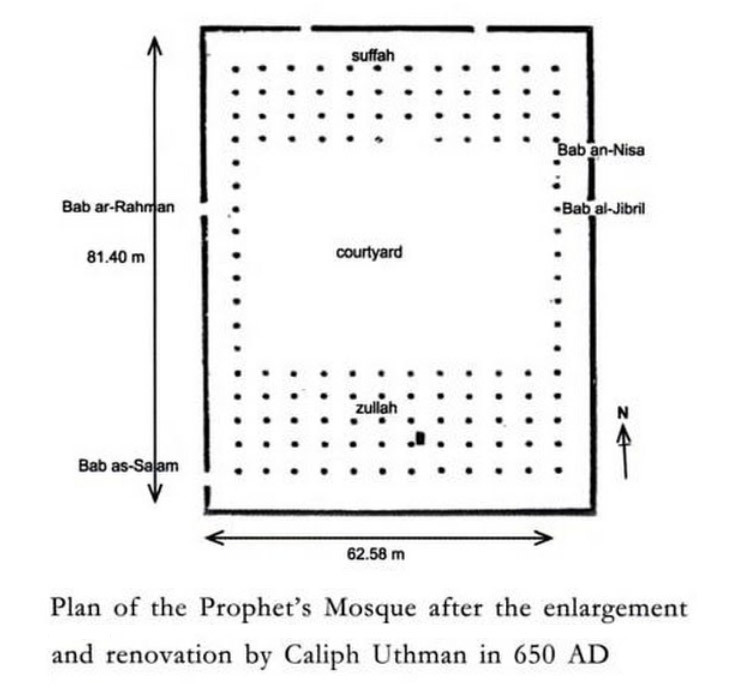 The expansion was officially complete on 5 Rabi al-Awwal 1375 AH (October 1956 CE). The mosque now measured 128 metres from north to south and 91 metres from east to west. The total size of the extended area measured 6024 square metres, bringing the total area of the mosque to 16,326 square metres. It could now accommodate 28,000 worshippers. The establishment of modern infrastructure, easier means of travel and improved accommodation saw the number of pilgrims to Makkah and Madinah skyrocket at the start of the 1960s. By the 1970s, the number of visitors reached one million, causing overcrowding in Masjid Nabawi, despite the previous renovation. 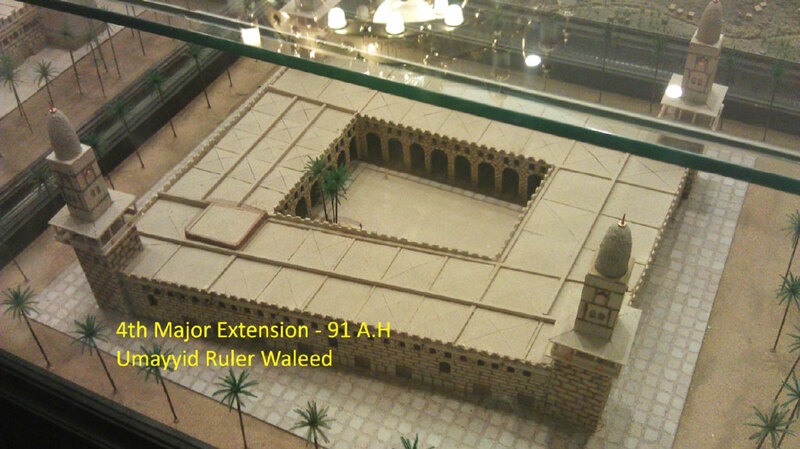 Seeking a solution, King Faisal ordered a prayer area to be built on the western side of the mosque in 1393 AH (1973 CE). Land on that side of the mosque was purchased and its buildings were demolished, allowing a sheltered prayer section to be built with an area of 35,000 square metres. The project cost 50 million Saudi Riyals ($13.5 million). Although more worshippers could now be accommodated, the arrangement was only temporary and a more permanent resolution was required. These shelters were removed a decade later, when Masjid Nabawi saw its second major expansion under the Saudis. In the 1980s, King Fahd commissioned a second Saudi expansion program that would greatly expand Masjid Nabawi and its capacity. Although Masjid Nabawi received approximately the same amount of visitors as Masjid al-Haram in Makkah on a yearly basis, Masjid al-Haram was almost ten times the size of the Prophet’s ﷺ mosque. An ambitious plan was therefore needed to increase the size of the masjid. Research was undertaken and plans were made for three years before King Fahd laid the foundation stone marking the initiation of the expansion in 1406 AH (1985 CE). Construction began in the month of Muharram of the same year. As with the previous Saudi expansion, a factory was established outside the boundaries of Madinah to manufacture artificial bricks and stones, which were to be used in the construction of the building. Prior to the construction itself however, the land on which the new structures were to be built on had to be prepared. About 400 buildings in the surrounding area were demolished by bulldozers. The rubble from these buildings was transported to a landfill site on the edge of the city and the land was cleared. The enlargement of the masjid involved building three new structures on the north, east and west sides of the existing structure. Marble was used extensively throughout the structure, particularly for the flooring. The front of the mosque i.e. the southern section, remained the same, as was the case with the previous Saudi expansion. The historical elements associated with the Prophet ﷺ remained preserved and the distinguishing characteristics of Sultan AbdulMedjid’s build remained intact. Square section, 5.5 metres in diameter, 27 metres high and covered with granite stone. Octagonal section, 5.5 metres in diameter, 21 metres high and covered with artificial coloured stone. Cylindrical section, 5 metres in diameter and 18 meters high. Another cylindrical section, 4.5 metres in diameter and 15 meters high. Conical section with a 6.7 metre bronze crescent weighing 4.5 tonnes and plated in 14 karat gold. The focal point of the expansion, the ground floor measures 82,000 square metres in area and 12.55 metres in height. A total of 2,104 pillars were distributed across this level, with a distance of six metres between each pillar. The flooring was clad with marble imported from Spain and Italy and high quality carpets were laid in the masjid. The capacity of the ground floor is 167,000 worshippers. The expansion also included the construction of a basement which was 4.1 metres high and paved with ceramics. It was specifically designed to accommodate various systems including air conditioning, ventilation, water and sewerage, fire alarms, fire extinguishing systems, drinking water, dome control, sound and CCTV surveillance. The roof area measures 76,000 square metres, 67,000 square metres of which can be used for prayer. This roof is able to accommodate about 90,000 worshippers and is also paved with marble. A section for women, with an area of 16,000 square metres was allocated in the north-eastern section of the mosque. Another section with an area of ​​8,000 square metres was also apportioned in the north-west. The thickness of the inner wall is 30 cm and the thickness of the external wall is also 30 cm. All of the walls and ceilings are built of reinforced concrete and are covered with artificial stone slabs. A large courtyard was built around the southern, western and northern sides of Masjid Nabawi. Some of it was paved with white marble which reflects the heat, while the rest was paved with granite and artificial stones, decorated with intricate Islamic designs. At night, special lights affixed to 151 granite and brass pillars illuminates the area. The total area covers 135,000 square metres which can accommodate about 250,000 worshippers. 27 open-air courtyards, each 324 square metres in area, were incorporated. These can be roofed by state of the art sliding concrete domes during increment weather or to allow natural light in. Each of these domes has a radius of 7.35 metres and weighs 80 tonnes. The domes are decorated with carved stone designs. There are also two larger courtyards in the masjid, which can be covered with retractable umbrellas. The domes and umbrellas, as well as various other electrical and mechanical systems around the masjid complex, are controlled by computers in the basement complex. In the north side of the masjid’s courtyard, 12 retractable umbrellas were erected. The canopy of each umbrella is made of thick, white cloth which is attached to an iron column clad in marble. The umbrellas serve to protect worshippers from heat and other increment weather. One of the largest and most innovative air conditioning systems of its time was also introduced to the masjid complex. 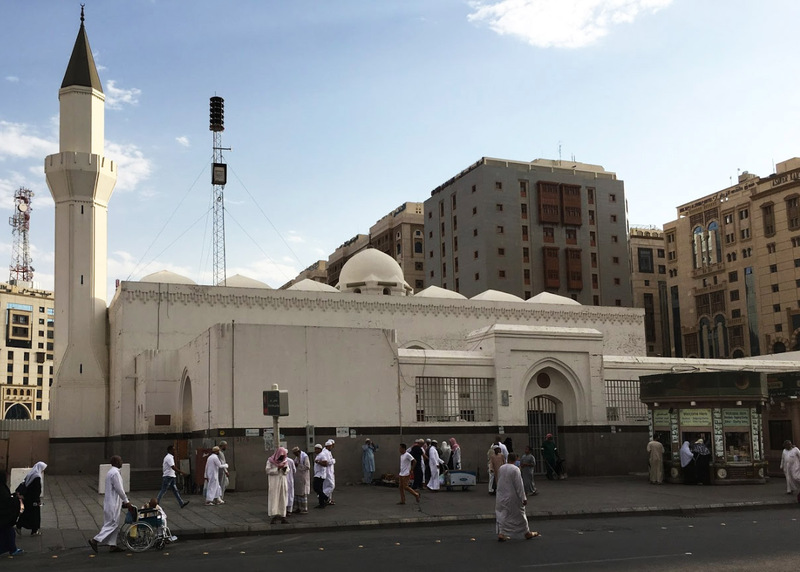 The system was able to pump 17,000 gallons of chilled water per minute from a plant located just over 4 miles away into the basement complex, where it was used to cool air throughout the mosque. A two storey underground car park, which can accommodate about 4,444 vehicles, was built under the courtyard surrounding the mosque on the south, north and west sides. The car park is connected to the main roads via six exits. The parking area contains 15 comfort stations. Each station contains 690 water foundations, 1890 toilets and 5600 ablution units. These units are connected to the courtyard via escalators. 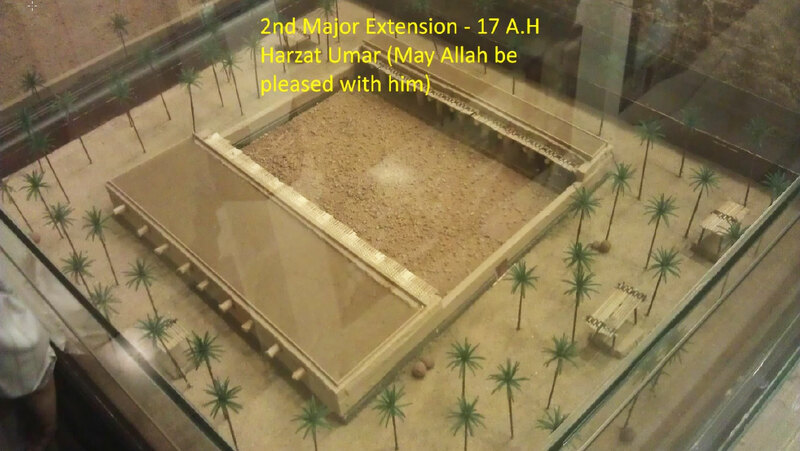 The expansion of the masjid took nine years and was finally completed in in April 1994 CE (1414 AH). Masjid al-Haram in Makkah was also being expanded at the same time as Masjid Nabawi and the total cost for the expansion of the two holy mosques came to approximately 70 billion Saudi Riyals ($18.6 billion). The total size of the expansion measured 384,000 square metres, bringing the total area of the mosque (including the surrounding area around the masjid) to just over 400,000 square metres. This entire area is able to accommodate over one million worshippers at peak times. In August 2010, by the order of King Abdullah bin Abdul Aziz, a project which involved the installation of 250 retractable umbrellas in the courtyard of Masjid Nabawi was completed. The total area covered by the umbrellas, when the canopy of each one is fully extended, is 143,000 square metres. Each umbrella can protect about 800 worshippers from the heat of the sun and can also prevent them from sliding or falling on the courtyard floor in the event of rain. The total cost of the project was 4.7 billion Riyals ($1.25 billion). In September 2012, King Abdullah announced that the third major Saudi Expansion of Masjid Nabawi would be taking place. According to the plans, the area of the mosque will be increased to 614,800 square metres. The entire area of the mosque and the surrounding courtyard is estimated to cover 1,020,500 square meters, which would be able to accommodate a total of 1.8 million worshippers – one million inside the mosque and 800,000 in the courtyard. As of 2019, the third expansion is still in progress. Jibal al-Jamawat (Arabic: جبال الجماوات) is a group of three small mountains clustered to the west of Madinah, extending over part of Wadi al-Aqeeq.